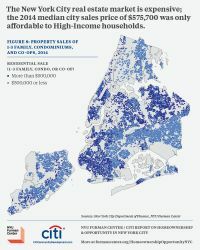 The NYU Furman Center / Citi Report on Homeownership & Opportunity in New York City analyzes recent home sales data and examines the potential purchasing power of households at various income levels in New York City, as well as the nearby counties of Nassau, Suffolk, and Westchester. It finds that becoming a homeowner in New York City’s real estate market is a considerable challenge for the vast majority of New York City households due to the city’s severely constrained supply of affordable home-buying opportunities, and homeownership prospects do not necessarily improve by moving out of the city to the surrounding New York suburbs. 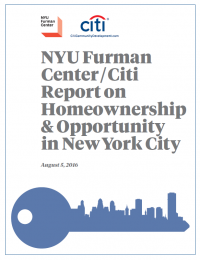 Read the NYU Furman Center / Citi Report on Homeownership & Opportunity in New York City. 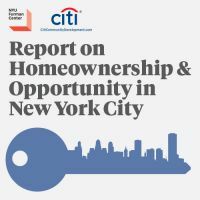 Read a summary of key findings from the NYU Furman Center / Citi Report on Homeownership & Opportunity in New York City. View infographics from the NYU Furman Center / Citi Report on Homeownership & Opportunity in New York City.